1. Bitmap Font: Using the unique “Bitmap Font” you can now enjoy reading pages in Arabic, Persian, Urdu, and Hindi, even if your phone doesn’t support these languages. 2. Greater Languages Support: Bengali is now supported. 3. eMule and FTP Downloading Support: You can now download files to UDisk via eMule and FTP by using Cloud Download. The app “UC Browser” (461 KB) is ready to download or send to your phone as filename:”UC91″. This is an unsigned version which is required for Boost Mobile phones. For a signed version that’s also modified to remove the virtual keypad that appears on some touch screen phones click here. I can not read on uc browser amharic language help me. The UC Browser doesn’t support amharic. Opera Mini does if you enable bitmap font support. sir,i can’t watch bengali font in uc9.1. and my phone does not support bengali language.how can i solve this? 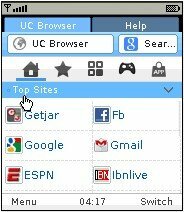 Try asking on the UC Browser Forum, maybe someone has created a modded version that includes Bengali fonts. Hi. I using lgkp500 . I cant us as eny version uc browser .Help me pls. Try installing UC from http://wap.ucweb.com using your phone’s browser. If that doesn’t work report the issue on the UC Browser forum at http://forum.ucweb.com/forum.php. hi sir, can i read amharic scripts in uc web 9.1? UC Browser for Android doesn’t support bitmap fonts. Opera Mini does. hey Dennis..i was wondering if you were going to get the uc browser 9.2 soon?? Dennis your browser could be better than opera, its more spacious and clearer but not user friendly, its like the user has no control of the sites they want to visit or view, I had a hard time navigating to the sites I wanted not the sited you want us to click on. A great browser, but still not better than Opera. Works on the Innuendo but still no where near as good as Opera 7.1. Dennis, works on my incognito but not much difference from version 9. wish uc would increase browser font size like in 8.4, which stills works the best on the incognito. thanks!. Thanks for the report. You can change the font size in the Appearance section of the Settings Menu. The Large size quite large on my LG Rumor Reflex.